Let us continue our discussion of book III of Cicero’s De Finibus, which is organized around a dialogue between Cicero and Cato, where Cato explains the basics of Stoicism to his friend. Beginning around #41, Cato launches into an explanation of some major differences between the Peripatetics (followers of Aristotle) and the Stoics. And these differences are both important and still relevant to anyone interested in practicing virtue ethics in modern times. The best example perhaps comes a little later, when Cato explains that for the Stoics health, for instance, is “deserving of a certain value,” but it is not per se a good, because of course the only good for Stoics is virtue. It is hard to underestimate what Stoic philosophy achieved by this move: it positioned itself between Aristotelianism and Cynicism. For the Cynics, not only virtue was the only good, but everything else had no value. This led them to a life of asceticism that few would be attracted by. The Peripatetics, on the contrary, thought that not just virtue, but a number of other externals, such as health, wealth, education and even good looks were goods. Which meant that if someone were not sufficiently lucky she could not hope to have a eudaimonic life. The Stoics struck the middle ground: virtue is the only good, and so one can be eudaimonic regardless of accidents of birth or position. But some externals had value and others were to be avoided, the Stoic famous distinction between preferred and dispreferred “indifferents” (indifferent to moral virtue, that is). I honestly find this one to be of the most appealing aspects of Stoic philosophy: everyone can be a good person, but one doesn’t have to become a saint to be a good person. So virtue is an all or nothing thing, not admitting of degrees. This flies in the face of commonsense, and it also contradicts the Stoics’ own idea that most people are not Sages (the Stoic ideal of a virtuous person), and frankly it is hard for me to see what work this notion could possibly be doing within their system in order to be worth preserving. What the Stoics did subscribe to that makes more sense to me is the related idea of the unity of virtues: while they recognized four main virtues (practical wisdom, courage, justice and temperance), and indeed a number of sub-virtuous (e.g., self-control is a type of temperance), they also held that, at bottom, all of these are aspects of one single virtue. This makes sense because one wouldn’t want to say, for instance, that a courageous but unjust person is virtuous, even partially so. Virtue comes in a package, so to speak. But, again, it doesn’t seem to me to have to come in a single measure too. At #60 Cato makes the Stoic case for suicide, which is based on the distinction drawn above between things that are good and things that are valuable or not valuable: “When a man’s circumstances contain a preponderance of things in accordance with nature, it is appropriate for him to remain alive; when he possesses or sees in prospect a majority of the contrary things, it is appropriate for him to depart from life. This makes it plain that it is on occasion appropriate for the Wise Man to quit life although he is happy, and also of the Foolish Man to remain in life although he is miserable.” As we know, historically Cato followed through with this advice in a stark manner, in order to escape capture by the allies of his enemy, Julius Caesar, who were seeking to use him for political advantage. Again, this makes sense to me. It means that Stoic ethics is naturalistic (we begin with natural instincts, which we today would say have been put in place by natural selection), and we expand on those by means of reason — reason being, of course, a unique human characteristic that allows our species to pursue social living in a way that is impossible for any other species on the planet. At #67 we get an interesting defense, of all things, of private property: “just as, though the theatre is a public place, yet it is correct to say that the particular seat a man has taken belongs to him, so in the state or in the universe, though these are common to all, no principle of justice militates against the possession of private property.” The Stoics were no communists, it seems! And Cato follows that by stating that the Wise Man should engage in politics and government, have social relations including marriage, desire to have children, and experience positive passions, such as love. Nothing too radical there, though my special interest in this passage lies in the reference to politics and government: Stoicism, unlike Epicureanism, is a philosophy of social engagement. 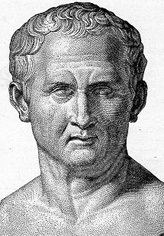 The dialogue ends on an interesting note, when Cato explains to Cicero (at #72) that the Stoics think that both dialectic and natural philosophy are “virtues” (meaning that they ought to be studied and employed correctly), since they respectively tell us how to guard ourselves against errors of judgment concerning either what other people say, or how the world works. This helps us making sense of the classic Stoic idea that the study (and, most importantly) the practice of ethics requires also the study of both “logic” and “physics.” Remember that for the ancients ethics was the discipline that was concerned with how to live a good life (i.e., it had a much wider meaning than the modern sense of the word), and one cannot really live a good life unless one has a good idea of how the world, as well as fellow human beings, work. This entry was posted in Ancient Stoicism, Cicero on August 13, 2015 by Massimo.